"I am revealing for the first time, he was telling me about it for past 6-7 months before his resignation. He gave it even in writing. He did a good job as RBI Governor," says PM Modi. Prime Minister Narendra Modi on Tuesday cleared the air on the resignation of former RBI governor Urjit Patel, saying Patel himself requested to step down, and that he was thinking about quitting for the past 6-7 months. "He (Urjit Patel) himself requested (to resign) on personal reasons. I am revealing for the first time, he was telling me about it for past 6-7 months before his resignation. He gave it even in writing. No question of political pressure. He did a good job as RBI Governor," said the Prime Minister during an interview with news agency ANI. In his first interview of 2019, Prime Minister Narendra Modi talked about everything from demonetisation to GST to the Rafale deal controversy to the issue of Ram temple in Ayodhya. The PM also set the tone for the 2019 General Elections, saying the Lok Sabha polls are going to be about 'janta' versus 'gathbandhan'. Here are 10 major highlights of Prime Minister Narendra Modi's first interview of the year. 1. 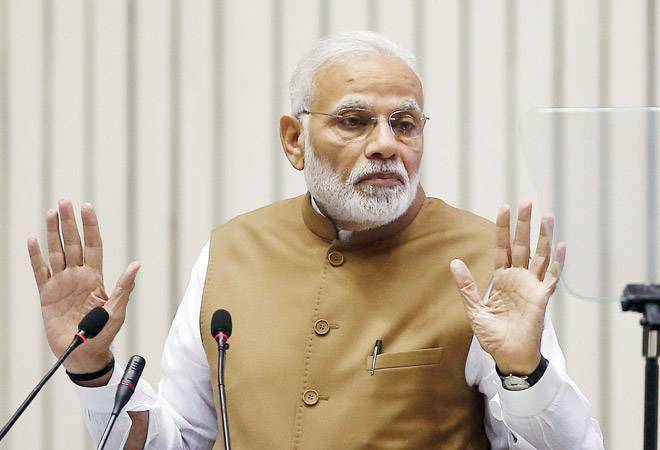 Lok Sabha Elections and Ram Temple: The Prime Minister Narendra Modi said it is going to be 'Janta' versus 'gathbandhan'. "Modi is just a manifestation of public love and blessings." On the issue of bringing an ordinance on the Ram temple, the PM said: "We have said in our BJP manifesto that a solution would be found to this issue under the ambit of the Constitution." He added that the judicial process in the matter was being slowed down as the Opposition parties were creating "obstacles". 2. AgustaWestland scam: The PM said the Congress was trying to shield a middleman, Christian Michel, arrested in the scam. "If a Congress worker turns up to be Christian Michel's lawyer, then it is worrying. People should be proud a 'razdaar' has come, now there will be a legal inquiry and the truth will come out. Instead of that, you are sending lawyers from your party to support Michel." 3. The Rafale deal: The PM said the Rafale allegations are not on him but on the government. "However, the Opposition has failed to prove anything. I have cleared the air on it in Parliament too. The Supreme Court had also clearly given its view on it." He also said: "Those people who want to weaken the Army are levelling allegations. Should I worry that they are making personal attacks on me, or whether my country's needs should be met? I decided that whatever abuses are hurled at me, whatever allegations are levelled against me, I will continue on the path of honesty and give primacy to the country's security. I won't leave my Army jawans merely to their fate. Whatever be their requirement, I will expedite the procurement processes. I will do it even if allegations are levelled me," PM Modi says. 4. Goods and Services Tax: On the GST being called 'Gabbar Singh Tax', the PM said the government has been consistently trying to reduce taxes under the GST. He also slammed the Congress for criticising the initiative that itself was started during the UPA. "The way someone thinks is the way someone talks. Have GST processes not been done taking a consensus with all political parties in the country? Since Pranab Mukherjee was FM, the GST process has been going on," he said. 5. Farm distress: The PM said loan waivers were not the solution of the farmers' issues. Defending calling loan waivers by the Congress governments in states a 'lollipop', the PM said: "Lying to people is what I call a lollipop. They did not waive loans of all the farmers, which is why I call it a lollipop. If farmers get benefit from the farm loan waiver, then its fine, do it. But that has not happened. So the solution lies in making the farming system stronger. There are around 100 schemes that have been initiated by our government for the welfare of farmers." 6. On economic offenders who fled the country: The PM said the government was taking all possible measures to bring back the fugitives. "First of all, why did they flee? Because they had the fear of the current government... we are using all the international laws to nab such economic offenders. We are using all the tools to bring them back. I believe all those who fled during the current government's tenure will come back, even though such people never came back during the previous government's tenure." 7. Demonetisation: Defending the demonetisation move, the PM said the move was necessary to formalise the economy. He accepted that the common people had to face inconvenience initially but said the move benefitted the country at large. "A formal economy was needed in our country. The parallel economy had eaten into the real economy. With demonetisation, the money has come into the system, and tax collection has increased. Don't you call it a success?" 8. On the year 2018: PM Modi said 2018 was a successful year for India as a country. "Elections are just one facet of a number of facets. If poor are given insurance of up to Rs 5Lakh, Ayushman Bharat Yojna. In such big numbers people were suffering, today they have got treatment, how can I consider this a failure?" asked PM Modi. 9. On Doklam standoff: "India should be judged on the basis of its response in Doklam. And nothing has happened with India that can be considered as deceit, but our principled position has been that we want friendly relations with neighbours," said the PM. 10. On his tenure as PM: "I leave it to people to decide whether satisfied or not with my work. But one thing, I am not surprised, I could neither make the Lutyen's world part of me or I a part of them," he told ANI.